Some 127 Ghanaian detainees in Libya have arrived in Ghana after government facilitated their release from the Libyan authorities. 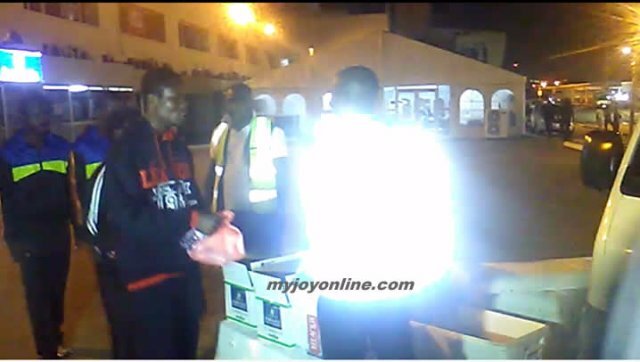 The returnees who are illegal migrants landed at the Kotoka International Airport by two flights, Air Libya and Afriqiyah among them was a woman, a physically challenged man, and children. They were met by government officials and officials from the International Organisation for Migration who stood by to give them food and water. Joy News’ Komla Adom reported two Metro Mass buses stood by to transport them to the Nkrumah Circle in Accra, where a strong transportation network is expected to help them find their way home. The government paid each about 400 cedis to pay for their transportation back home. Chilling stories of dehumanizing treatment ranged from robbery to murder. One told Komla Adom, he travelled with 17 others from Takoradi but only four were able to return. They killed seven. He said in a detention center that held about 3,000 illegal migrants, "people went mad everyday…people died everyday"
He said they never bathed since they were arrested and detained. "When you have to eat you are beaten, if you want to drink water you are beaten." He expressed great regret for leaving Ghana to seek greener pastures in Libya. "If you are doing some small work here then don't think of travelling to Libya". A 28-year old Ansah said he was kept in an uncompleted building for six months where he was fed in the morning and given salt water in the afternoon. The returnees said even kids rob migrants at gun point. The arrival comes as the world wakes up to the shocking auctioning of African youths in modern-day slave markets in Libya for as little as $400. Libya is the main transit hub for refugees and migrants attempting to reach southern Europe by sea. They are coming from countries like Nigeria, Eritrea, Guinea, Ivory Coast,, Gambia, Senegal, Sudan and Somalia. The power vacuum in Libya after the fall of Muammar Gaddafi has made human trafficking and people smuggling a booming trade. At least three Ghanaian migrants have reported being among those who were auctioned as slaves in Libya, Ghana’s Foreign Minister, Shirley Ayorkor Botchway has revealed.